USB Flash Drives, despite the increasingly frequent use of cloud services, have been by our side for years. Thanks to the fragmentation of the speed of the network in our country, it is not always possible to download large files. So, thanks to the increase in memory cuts and the fall in price, using a USB flash drive can be the fastest and most economical solution. But do we really know its characteristics? Apart from the available GBs and the form factor, it is difficult to focus on the build quality or the transfer speed of the USB flash drive. We try to understand together what can change between multiple types of USB flash drive in order to choose the one that best suits our purposes. Capacity is certainly one of the major discriminating factors in the choice of USB flash drive. If you intend to use them to move documents and images of little weight, it will be enough to buy a 4 GB model. They will be so cheap but more than suitable for your purpose. If you are dealing with files of a few dozen MB, such as raw images or PDF a bit more body, opt for USB flash drives from at least 8/16 GB may be the right choice. This will not force you to periodically delete the archived files, perhaps having to review them all to find the most important. Finally, if video files are your daily bread, or you want to use USB flash drive for playlists of audio tracks, the choice is obligatory. With 32/64 GB, if not 128, you will have all the space, you need. Keep in mind that one minute of 4K video with a modern smartphone takes up about 350 MB of memory. The same speech is valid for high-resolution audio formats. An hour of audio in flac format, will occupy about 600 MB of memory space. The standard of USB flash drives provides that they meet well-defined criteria. The most recent is USB 3.1, version 3.0 update. The fundamental thing that the standard indicates to us is the theoretical maximum transfer speed. Always remember that these values are expressed in MegaBit. For clarity, 1 GigaBit is equivalent to 125 MB. While technology 1.1 has practically disappeared, version 2.0 still needs to be supplanted. Moreover, even if backward-compatible, the 3.0 standard will be slower if connected to a PC that does not own it. If you want to know something more about the connections (also valid for USB flash drive), we invite you to read this article. As you can guess, the real transfer speed is very different from the theoretical one. It is expressed in MB/s and affects the time it takes to copy the data. If the files you use are mostly of a few MB, you will be relatively interested. However, if you frequently move movies, images, .iso, or other types of consistent files, the subject changes. We are sure that if you have to go out in a hurry, and you have not copied the files to the USB flash drive, do not take hours to do it. The speed is indicated both in reading and in writing, usually in this format: 30/15 MB/s. Unfortunately for you, especially the cheaper models do not report these values. If it is an important feature for you, we advise you to spend a little more, but to buy quality USB flash drives. In addition to those just listed, there are other important features, but that are not always considered. Dimensions : although it may seem strange, it can be a good criterion of choice. There are really small USB flash drive, which are designed for use on car radios with USB input. If, on the one hand, they can be comfortable, it is really easy to lose them. Furthermore, less material around the memory means less protection in the event of a fall. Encryption : there are more and more USB flash drives with this feature. This way, you can always keep your data safe. They are especially recommended if you use support for work and then do not want others to access your files. Encryption can be applied either through software or already integrated into USB flash drive. Robustness : very useful if you work in ” difficult ” environments. There are USB flash drive certified against water, dust and falls. You can hardly find them in physical stores, while on the net, they are easily available. Below is the top 10 ranking of the best-sellers and appreciated USB flash drives of the moment, divided by capacity. The list is updated every day automatically. 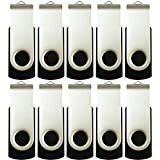 1 5 X MOSDART 8GB USB2.0 Flash Drive Swivel Bulk Thumb Drives Memory Sticks Jump Drive Zip Drive with... 1,986 Reviews $16.99 See Offers! 2 SanDisk 16GB 2.0 Flash Cruzer Glide USB Drive (SDCZ60-016G-B35) 5,093 Reviews $16.60 $4.99 See Offers! 3 RAOYI 10 Pack 8GB Swivel USB Flash Drive Metal Thumb Drives Pen Drive USB 2.0 Bulk Flash Drive... 108 Reviews $35.99 $25.97 See Offers! 4 10 X Enfain 8GB USB 2.0 Flash Thumb Memory Stick Zip Pen Drive Black, Ideal for delivering marketing... 1,935 Reviews $27.50 See Offers! 5 SanDisk Cruzer 16GB USB 2.0 Flash Drive (SDCZ36-016G-B35) 17,588 Reviews $9.99 $5.99 See Offers! 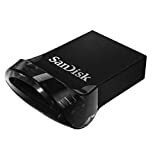 1 SanDisk Cruzer CZ36 16GB USB 2.0 Flash Drive, 2 Pack (2x16GB), Frustration-Free Packaging-... 17,588 Reviews $12.00 $10.99 See Offers! 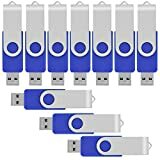 2 16GB USB Flash Drive 16G Flash Drive USB 2.0 Flash Memory Thumb Stick Swivel USB Drive 10pcs Blue 503 Reviews $27.99 See Offers! 3 SanDisk Ultra Flair 16GB USB 3.0 Flash Drive - SDCZ73-016G-G46 3,490 Reviews $14.99 $6.79 See Offers! 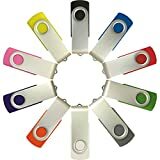 4 Enfain 16GB USB Flash Drive Memory Stick Thumb Drives (MultiColor, 10 Pack) 714 Reviews $29.98 See Offers! 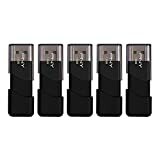 5 PNY Attache USB 2.0 Flash Drive, 16GB / BLACK / 5 PACK (P-FD16GX5ATT03-MP) 5,925 Reviews $27.99 $22.99 See Offers! 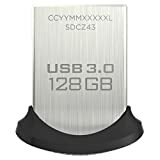 1 Samsung BAR Plus 32GB - 200MB/s USB 3.1 Flash Drive Champagne Silver (MUF-32BE3/AM) 1,127 Reviews $13.99 $9.99 See Offers! 2 SanDisk Cruzer Glide CZ60 32GB USB 2.0 Flash Drive - SDCZ60-032G-B35 5,093 Reviews $17.99 $7.99 See Offers! 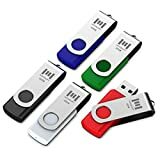 3 Kootion 5 X 32 GB USB Flash Drive 32 gb Thumb Drive Memory Stick Swivel Keychain Design Mixcolor 474 Reviews $18.99 See Offers! 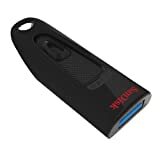 4 SanDisk Ultra CZ48 32GB USB 3.0 Flash Drive Transfer Speeds Up To 100MB/s-SDCZ48-032G-UAM46 1,220 Reviews $9.20 $8.85 See Offers! 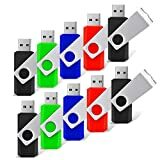 5 mosDART 5 X 32GB USB 2.0 Flash Drive Swivel Bulk Thumb Drives Jump Drive Zip Drive Memory Sticks... 1,986 Reviews $21.99 See Offers! 1 SanDisk Ultra Flair 64GB USB 3.0 Flash Drive - SDCZ73-064G-G46 3,490 Reviews $14.99 $13.29 See Offers! 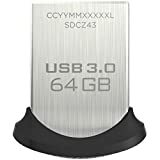 2 SanDisk Ultra CZ48 64GB USB 3.0 Flash Drive Transfer Speeds Up To 100MB/s (SDCZ48-064G-UAM46) 931 Reviews $14.99 $13.99 See Offers! 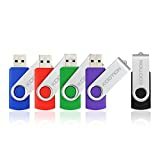 3 KOOTION 5 X 64GB USB2.0 Flash Drives Thumb Drives Memory Stick (5 Colors: Black Blue Green Purple... 474 Reviews $33.99 See Offers! 4 SanDisk Ultra Fit 64GB USB 3.0 Flash Drive - SDCZ43-064G-GAM46 5,582 Reviews $18.99 $13.29 See Offers! 5 Samsung BAR Plus 64GB - 200MB/s USB 3.1 Flash Drive Champagne Silver (MUF-64BE3/AM) 1,127 Reviews $22.99 $15.99 See Offers! 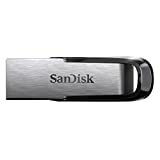 1 SanDisk Ultra Flair 128GB USB 3.0 Flash Drive - SDCZ73-128G-G46 3,490 Reviews $79.99 $23.99 See Offers! 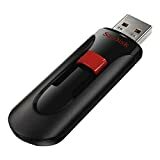 2 SanDisk Cruzer 128GB USB 2.0 Flash Drive (SDCZ36-128G-B35) 17,588 Reviews $20.99 $19.99 See Offers! 3 Sandisk CZ48 128GB USB 3.0 Flash Memory Drive - SDCZ48-128G-U46 1,346 Reviews $22.99 $22.95 See Offers! 4 SanDisk Cruzer Glide CZ60 128GB USB 2.0 Flash Drive- SDCZ60-128G-B35 5,093 Reviews $20.99 $19.99 See Offers! 5 SanDisk Ultra Fit 128GB USB 3.0 Flash Drive - SDCZ43-128G-GAM46 5,584 Reviews $32.93 $24.99 See Offers! 1 SanDisk Cruzer 256GB USB 2.0 Flash Drive (SDCZ36-256G-B35) 17,588 Reviews $69.99 $39.99 See Offers! 2 SanDisk 256GB Ultra Fit USB 3.1 Flash Drive - SDCZ430-256G-G46 1,356 Reviews $79.99 $44.99 See Offers! 3 SanDisk Ultra Flair 256GB USB 3.0 Flash Drive - SDCZ73-256G-G46 3,490 Reviews $50.00 $44.99 See Offers! 4 Samsung MUF-256AB/AM FIT Plus 256GB - 300MB/s USB 3.1 Flash Drive 370 Reviews $84.99 $54.99 See Offers! 5 SanDisk Cruzer Glide CZ60 256GB USB 2.0 Flash Drive - SDCZ60-256G-B35 5,093 Reviews $43.00 $39.99 See Offers!